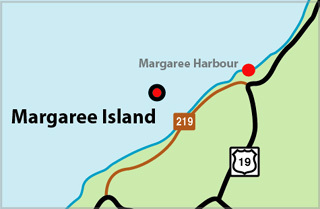 Margaree Island Lighthouse is situated on Margaree Island, also known as Sea Wolf Island, 8 miles SW of Margaree Harbour, Cape Breton. The shore of the island is bounded by submerged rocks. Swell rolls entirely around the island and there is also a strong tidal flow near the island and between it and the mainland. The building of the lighthouse was therefore important to the fishermen in the area. ACKNOWLEDGEMENT: Sailing Directions, Gulf and River St. Lawrence, 1985, Department of Fisheries adn Oceans. 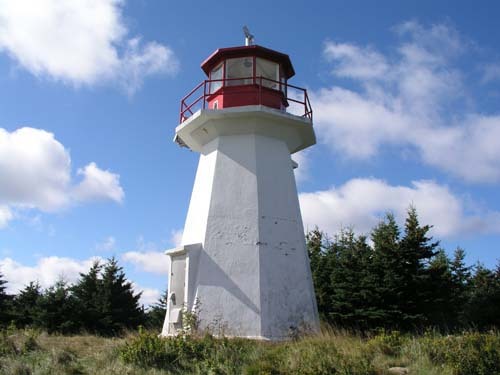 Photo - © Don MacDonald, Margaree Island Lighthouse - An example of a smaller concrete lighthouse. Light Height: 298ft feet above water level.